Demonstrating the existence of simple life forms (past or present) on a cosmic body other than Earth is exceedingly challenging: (1) A naturally sceptic scientific community expects the evidence to be convincing—for example, several independent lines of analyses performed on a feature where the results can only be explained by a biological process. (2) Most bodies are difficult to explore in situ, just about the only way to achieve the above goal, and even then, typically, several missions are required to understand where to go and what to study. (3) Planets and moons that can only be observed remotely (e.g. exoplanets) or from orbit can at best provide some indirect hints of life potential. The actual verification of life would require studying samples containing biosignatures. With the exception of some active moons where jets and plumes may provide the means for satellites to analyse surface sourced material, most other cases require landing, exploring, collecting samples, and analysing them in situ—or bringing them back to Earth. In this chapter we look at Mars as an example case and propose a scoring system for assigning a confidence value to a group of observations aiming to establish whether a location hosted (or still harbors) microbial life. Life-seeking missions to other planets should target as many biosignatures as possible. Their discoveries cannot be conclusive unless they include powerful analytical chemistry instruments able to study biosignatures of biomolecules and their degradation products. The Exomars Science Working Team composed of ExoMars rover and surface platform instrument scientists as in Vago et al (2017). The Authors would like to thank the ExoMars project team and scientists (past and present), as well as our colleagues from industry. We would also like to recognize the help and support of ESA, Roscosmos, the European states and agencies participating in the ExoMars program, and NASA. Portions of this Chapter have appeared in Vago et al. 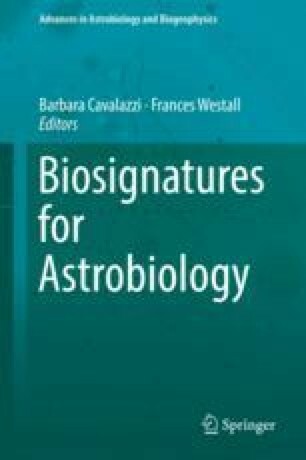 (2017) and are included courtesy of Astrobiology.